BAU 2019 is bigger than ever. On 200,000 square meters exhibition space the BAU presents architecture, materials and systems for commercial and residential construction, as well as for interior design of both new and existing buildings. In a new series of articles we report on the key topics coming up in the individual exhibition spaces. The fourth part deals with the topics of Roof building materials / Bricks, Steel / Stainless steel / Zinc / Copper as well as Chemical building products / Construction tools. In view of climate change and the increasingly frequent and heavy storms entailed by it, resistance against weather extremes—large amounts of precipitation, strong wind suction or hail—continue to gain importance. Particularly at the edge of the roof, wind suction forces cause enormous damage which may lead to the destruction of the entire waterproofing. The stability of the roof edge trim profiles is therefore being placed more and more in the foreground. Flat roofs are a particular challenge for planners and manufacturers as far as waterproofing and drainage are concerned. A youth hostel in Bayreuth [Bavaria], which was opened in 2017, reconciles functional requirements with design aspects in its roof. The futuristically designed three-wing roof has been sealed by means of a self-adhesive roof and waterproofing membrane with a high polymer alloy consisting of ethylene vinyl acetate terpolymer (EVA) and polyvinyl chloride (PVC). The light, smooth surface is dirt-repellent, reflects thermal radiation and is resistant against root penetration and rootstock at the same time. When it comes to rainproofing, clay roof tiles continue to set the tone: particularly tile-covered steep roofs allow water to drain rapidly; in addition, they score with a long service life and uncomplicated workmanship. Many builders would not like to do without these advantages; from an aesthetic point of view, however, they increasingly prefer the clear design language of the cubic architectural style. Thanks to their special design, new roof tile products achieve the advantages of steep roofs even for slightly inclined roofs starting from an inclination of ten degrees: this facilitates modern architecture without cost-intensive and high-maintenance waterproofing treatments. Besides roof tiles and roof-building materials, this exhibition segment features the most diverse range of product solutions for dormer windows and skylights as well as chimney-building materials. The wealth of applications for steel in the building sector ranges from high-rise buildings and bridges to flood and earthquake protection through to residential, industrial and commercial construction and intelligent facades. Trade-show visitors will be able to inform themselves not only about a wide range of stainless steel applications encompassing profiles, building and facade systems, but also about zinc and copper surfaces and systems. When using steel—as for example in infrastructure building—stability and resilience play a crucial role. Within the framework of a European joint project between associations, universities and companies, the LOCAFI assessment guide has been developed on the basis of the Eurocodes: it calculates the temperature in a steel pillar in the event of local fires and determines its capacity to withstand high temperatures. This approach, which consists in establishing a definition depending on capacity, leads to a reduction of the fire protection costs. Plans are to integrate calculations carried out using LOCAFI into existing building software by means of the recently developed Ozone Interface. Also the extension of the Digital Building Model (BIM) is relevant for the steel building industry. The open exchange standard for interfaces (IFC), for example, can be traced back to the DSTV interface of the German Steel Construction Association: it facilitates software-independent data exchange, the “Open BIM”. Cooperation for buildingSMART allows to implement the advantages of BIM and IFC in the German building industry by means of a joint strategy. Chemical building products and applications are used for the most diverse aspects of building projects. Relevant fields of application are, in particular, the topics of energy-oriented renovation, sustainability and energy efficiency: therefore, environmental and health aspects play a major role for the development, production and application auf chemical building products. Moreover, the program of the exhibitors will be decisively determined by a new series of standards for building waterproofing, which was published in July 2017 and applies to large parts of the industry, ranging from planning to implementation. “The new series of standards leads to an intensification of the communication between all those involved in construction projects that include building waterproofing”, predicts Norbert Schröter, General Manager of Deutsche Bauchemie. In detail, it is all about the waterproofing standards DIN 18531 “Seals for balconies, loggias and pergolas”, DIN 18532 “Seals for drivable traffic areas made of concrete”, DIN 18534 “Seals for indoor spaces” and DIN 18535 “Seals for tanks”. Appropriate products, such as crack-bridging mineral waterproofing slurries or reactive resins, will be on display, just like information on test requirements and the implementation or maintenance of the seals. In addition to seals, insulation materials and protection against heat, cold, fire and noise, this exhibition segment will also include plasters, varnishes, paints and adhesives. Moreover, there will be a great number of new products in the area of construction tools on display at BAU. For instance, there are important developments in the rechargeable battery segment. Due to improved cell technology, the new rechargeable battery packs of Metabo, for example, feature clearly more power and capacity—while their size has remained unchanged. The new manufacturer-independent CAS System (Cordless Alliance System) features a pioneering approach: nine manufacturers of electrical tools jointly present an rechargeable battery system based on the technology of Metabo, which does not only facilitate wireless working but also the use of machines of different manufacturers with only one rechargeable battery—an absolute novelty in the industry. 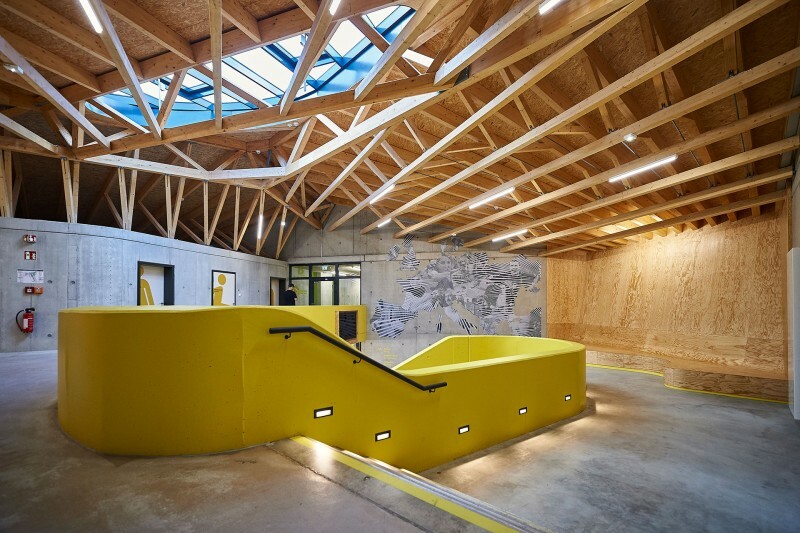 Bayreuth Youth Hostel: The timber support frame of the roof becomes a design element inside the building.